Test your knowledge to make it to Final Jeopardy! and the coveted Winner�s Circle! 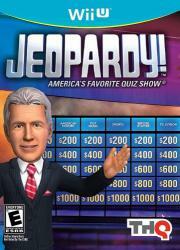 Use your quick wit to play 3,000 clues in Jeopardy!�, Double Jeopardy! and Final Jeopardy! The complete Jeopardy! Clue Crew of Jimmy, Kelly and Sarah bring the clues to life the first time in a game format. Vibrant HD graphics, improved menu interface and fresh in-game features!